The myths and allure of The Beat poets continues to intoxicate. Now fortunately not everyone is focused solely on its most notorious literary stars Jack Kerouac, Allen Ginsberg, and William Burroughs, et. al. There is renewed interest in the whole cultural scene that included visual art, poetry, music, dance, salons, public and performance art. 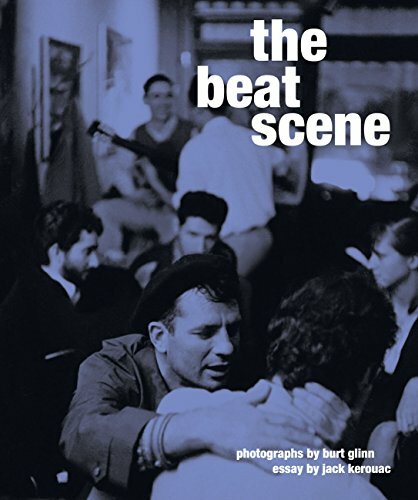 Newly discovered photo series by famed 20th century photojournalist Burt Glinn captures the broader cultural scope of the era in The Beat Scene published by Real Art Press, and it is without doubt one of the best archival photo titles of the year. Glinn was a self-taught photographer who made his name at Life magazine in the late 40s, then he was a freelancer, eventually joining Magnum Photos in 1951 (later becoming its president). A master of black and white photojournalism, and an early proponent of the use of color in news photography, Glinn was among an elite corps of photojournalists who documented such historic events as the Castro revolution in Cuba, the Sinai War in 1956, and the Marine invasion of Lebanon in 1958; he was even on the campaign trail with Robert Kennedy in 1968. He also was a noted portrait artist of celebrities including Katharine Hepburn, Andy Warhol, Sammy Davis Jr., and Elizabeth Taylor. The Beat Scene collection shows he was both a fine art photographer and a peerless photojournalist. Many prints in this collection have a painterly quality, a reminder that something can be lost in digital photography and old techniques of development were part of a specific art. Meanwhile, Glinn is a master of capturing the perfect evocative moment. What Da Vinci could do with blending texture and shadow, Glinn does in his color photography with his eye and understanding of natural lighting. The subjects in Glinn’s photographs are three-dimensional and alive; they breathe in these frames. This beautifully curated and designed book and this collection is an important cultural document, and beyond that, Glinn’s photographs are completely transporting. The color transfers are particularly stunning on the matte pages, and the dramatic layout brings you into this world. The scenes do not look posed in any way, nor do they appear voyeuristic. Glinn was obviously a trusted journalist in the beat scene. Spontaneous moments are captured in the poet’s grottos in the Village and on the streets. Many of the photographs are charged with intellectual engagement and sexual energy with the natural lighting, and the painterly composition that never appears to be posed, manipulated, or staged for the camera. The sense of the actual light, movement, and energy generated by the subjects in cafes, clubs, galleries, lofts, and on the street jumps out in so many of these photographs. Just as interesting is the supplementary text, particularly the brief notes by Glinn that annotate his own photographs, like a couple in sultry silhouette, bathed in blood red light at the Half Note club of Hudson Street. “A streak of loneliness runs through these gaudy evenings on the town” Glinn notes of his photograph of a young guitarist set against a blurred streetscape that “plays the last music of the night.” There are many intimate musician moments caught even in some of the jazz clubs that are packed with entranced bohemians. Equally revealing are obvious private moments of almost full frame portraiture of individuals, many not famous, but very much part of the arts community of the era: black poet Ted Joans, poised under an Africanist tribal mask, captivating a coffeehouse audience with words and stage presence; Gregory Corso sitting on the window ledge of Allen Ginsberg’s apartment in T-shirt, chinos, and hungover hair, looking every bit the lonesome, driven poet. Later, Corso disrupting an art event, while Glinn noted “In foreground, wisened Kerouac plays it cooler.” Writer Ray Bremserperched on a dusky lit fire escape railing; as Glinn describes he is “Beatnik jazz poet who probably describes himself as an ex-convict.” Writer/activist Amira Baraka, (formerly LeRoi Jones) holding his newborn baby. Abstract expressionist Helen Frankenthaler in her studio painting on huge canvasses. Alto-saxophonist Earl Bostic in silhouette playing chess between sets. Glinn photographs photographer Michael Tabb working with Cunningham dancer Anita Huffington in balletic poses in a sheer bodyglove. In the introductory essay, photographer Sarah Stacke writes about Glinn’s legacy to the artform. Stacke was hired by Glinn two decades ago to digitize his “massive archive” from six decades of “nonstop work.” Editor Michael Shulman gives background on how the unseen color negatives were discovered in Glinn’s studio. Glinn died in 2008, and his private archive was kept in his wife Elena’s home studio. When asked her if there were any other Glinn photos of the Beats, she pulled out boxes of unseen slides. The highlighted text entry, of course, is Kerouac’s essay: “this is the beat nightlife of New York.” It is written in classic Kerouac stream of consciousness and can be read as a self-parodying style with undeniable heart.